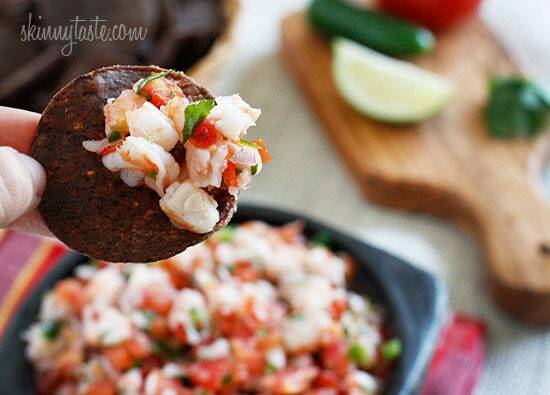 Skinny Shrimp Salsa is so good, you might not want to share! Made with shrimp, tomatoes, cilantro, red onion and lime juice. Bring this to a party and watch it disappear! A great option or any party or as a super bowl appetizer. Other salsas ideas I love are Pico de Gallo Salsa, Salsa Verde, and Avocado and Mango Salsa. This shrimp salsa is low-fat, gluten-free and perfect for low-carb diets, but you can switch it up and add black beans to boost the fiber, or roasted corn to add a touch of sweetness, and even avocado to add some healthy fats. Add more jalapeño to make it spicier and adjust the lime, cilantro and salt to suit your taste. You see where I’m going with this…. the possibilities are endless! I found these great black bean chips called Beanitos that are high in fiber which makes you feel full longer, low-glycemic, gluten-free and are high in protein, 10 chips are 3 points plus. My husband and daughter love them with guacamole or salsa. Combine diced onions, tomatoes, salt and lime juice in a non-reactive bowl and let it sit about 5 minutes. Refrigerate and let the flavors combine at least an hour before serving. Made this today, followed the recipe exactly except halved it, and I didn’t have any cilantro, darn! Really delish! I’m so excited! This with thin slices of Jicama would be yummy! I made this last night for a holiday pot luck party. It was a hit. Even better, my son loved it! This is my go-to hors d'ouevre now. So easy, incredibly tasty and a hit with company. Makes a good size amount and can be made ahead. Thank you for this! Sure any yummy looking tomato will do. I can't eat seafood but my friends would love this so I will let them know. love your recipes! I've tried so many of your recipes. Great taste without the guilt. this looks delicious. adding it to next weeks grocery list for dinner. Thank you! Can you use the canned shrimp? I'm not a big fan of cilantro is there something else i could substitute the cilantro with? This is so much like our Shrimp Campechana recipe. Try adding 2 avocados chopped and a bottle of Heinz Cocktail Sauce. Oh so good! I also add avocado and just a slight touch of olive oil. Delicious! Again, this dish was a delight at a wedding shower we had this past weekend. And, for leftovers, we warmed corn tortillas, scooped in some salsa, and topped with sharp cheddar cheese. Amazing. Thanks for ALL of your recipes. Your site is my go-to during the week and for special events. OMG. I made this for New Year's and it was off the chain. It was so good that I didn't just eat one serving..nor two. I could not help myself. Thank you Gina for looking out for those who want to eat healthy, but still enjoy what they are eating. Looking forward to your 2013 selections. This was a hit at Thanksgiving, so much that the family wants me to bring it for Christmas! I love this idea! This will be one of the appetizers before our Thanksgiving dinner instead of shrimp cocktail. Thanks! Can't wait to dig in!! I made this on Friday and instead of shrimp salsa, I served it as shrimp ceviche. Big hit! I'm going to combine 3 of your recipes The Skinny shrimp salsa recipe and The Zesty lime shrimp and avocado salad and The Summer tomatoes, grill corn, crab, avocado salad (- the crab)also add black beans (drain and rinse). I'm going to use Anaheim or Poblano pepper and will use salad shrimp, unless I get Costco to get there large cooked frozen Shrimp Wish me luck I'm going to all ladies golf pot-luck I'll sever it Tostitos Bakes Three Cheese Queso w/the salsa!!! Oh! some bay seasoning too! US LATINO'S MAKE SUMTHING SIMILAR TO THIS CALLED "COCTEL DE CAMARON". ADD ALL OF THIS PLUS AVOCADOS,KETCHUP, CLAMATO, TABASCO SAUSE AND SALTINE CRACKERS ON THE SIDE. 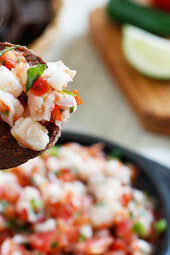 Can you nix the shrimp for a 0 point salsa? Such a great idea that I tested…and that pleased everyone 😉 Thank you for sharing. Simply love your blog! I made this for a husband's birthday BBQ. Everyone loved it and I also added some tapatio to spice it up. Great Ceviche type appetizer. Plus I used the salad shrimp that was frozen and defrosted. Great HIT! This will be my weekend recipe experiment! I have noticed that the bigger the jalepeno the less spicy it is. The smaller more kick. Removing the seeds will help the lower the spice. Hi Gina, So this would be OK to make the night before? Also, are you referring to the bags of frozen cooked shrimp? looks yummy, yummy! but will the jalapenos give it a real hot taste to it, if I use the given amount on the recipe? can you use less or none at all? Made this tonight….DELICIOUS! I'll definitely make this again. Made this and it was a hit. Did add two full jalepenos with seeds and added a bit more salt. Would also be good in a taco wrap. Also took seeds out of the tomatoes as I thought it would be too watery. Made a big difference. Will make again!!!! I am liking the sound of a shrimp salsa! I made this on yesterday and it is delicious! My daughter and I had Tostitos Bakes Three Cheese Queso w/the salsa!!! OMGoodness!!! This looks great!! Can't wait to make it. And those Beanitos are really good. They are a big hit in our house. Seriously???? Who cares what it's called (Pau F). It looks delicious and more importantly, this website has been a lifesaver for a lot of us. 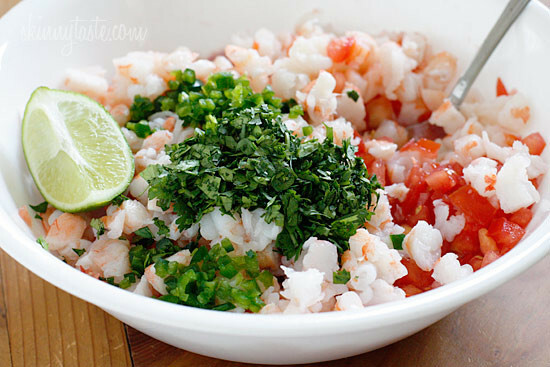 Who cares if you call it salsa or ceviche – it looks delicious and very yummy and I can't wait to make it! This is called CEVICHE, not salsa. Hi Gina – I've posted a link to your recipe as a resource for my readers. We loved it! Quick tip- I bought the premade fresh salsa from the deli and just added the shrimp. Delicious. Thanks for mentioning the beanitos! Picked some up at the store yesterday and both the hubby and I loved them. What a great healthy alternative to potato or corn chips!! I've been looking for a recipe like this! Made it for a party this weekend and what I brought was gobbled up! Used black beans and accidentally got curly parsley instead of cilantro, but it was still great. I had the leftovers on a grinder roll with lettuce and for my lunch today, over greens with some avocado. I'll be making this a lot! I'll try adding a little garlic next time. Thanks! Excellent! Had a hard time stopping eating it. I added a bit of garlic. I'd like to make this for a party on Saturday. However, in my neck of the woods tomatoes aren't tasty yet (even if the grocery store did have them shipped from someplace warm). Any suggestions or will I just have to wait until warmer weather here? I could turn this into a meal. I'll have to see if I can find the chips. If not the baked scoops would be good too. Yummmmmm…can't. Wait to try this! I am going to a BBQ in two weeks and I will DEFINITELY be making this to bring with me! I know everybody will love it. Will this be just as good if I use the small salad shrimp meat? I'm going to make this soon! Thinking of baking some tilapia to either eat along side or together as a fish/shrimp taco. One of my favorite dips!! 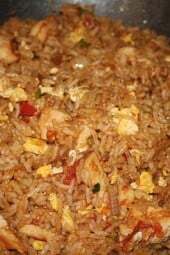 I make this and add green and red bell peppers! Sometimes I'll even add a little tabasco sauce to spice it up! This sounds so amazingly yummy! It's sure to be a summer staple. This sounds delish!! What a great hot day appetizer! Yummy! Hope you don't mind, I gave you a little award on my blog. Genius! I may have to try this this weekend. I have never seen anything like this – right up my alley! Simple, fresh, & delish! I made this for supper. Added red pepper and black beans to the salsa and threw in a WW pita with avocado. Yummers! That looks so easy and insanely yummy! Can't wait to try it! What a fabulous recipe!!! I love it!! This reminds me of ceviche! I had a ton of it in Costa Rica when I was there last month. Looks really good and definitely a crowd pleaser. That what I was thinking ceviche. Just add a few more ingredients. Sneaking into Gina's kitchen soon! Ceviche! Definitely add avocado… makes it that much more delicious! The ones in the can are cooked already, just drain and rinse. 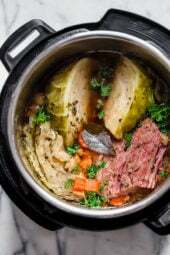 If you add black beans, do it straight out of the can or cooked? This looks great! It reminds me of ceviche in some ways, which is a very good thing. 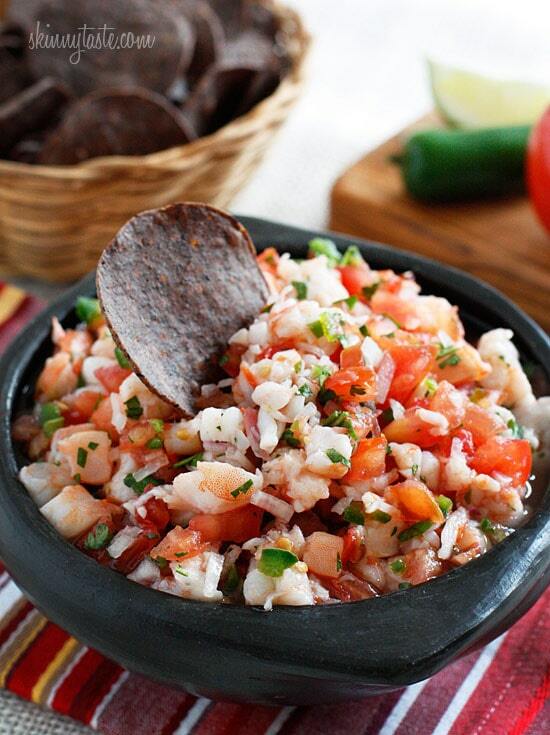 That's what I was thinking….pretty much is ceviche! where did you find the black bean chips??? There is a Wild By Nature by me, I think Waulbaums owns them. Similar, but different… I also love your recipe with avocado and jumbo shrimp. It was a hit at a party recently! Shrimps are not that often cooked in the house. 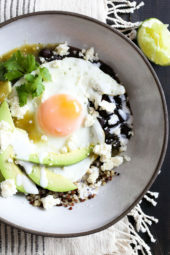 Saw this recipe and got the push to try it because of the interesting black beans that are high in fiber. =) I need to feel full longer =).. Yummy and healthy! Brilliant idea for salsa, Gina! It looks so fresh and colorful, and I bet it's delicious. This would be great (in a cooler, of course) for a day at the beach, when you need a little snack with protein. I make something like this with avocado – my husband goes crazy for it! I have to save him his own bowl that he doesn't have to share with everyone else! YUM! I cannot wait to make this! Thank you! Thinly sliced Jicama, too! Mmmmmmmmmmm! I am making this for a party Friday night. It's a grilling party so I thought it would be perfect. Thanks so much for the recipe! I make something very similar to this and it's wonderful! The shrimp just add something extra special. I know, right?! I would use this for tacos! I can't wait to make this for a summer party. Bookmarked! I love the idea of adding black beans too – this over a bowl greens would make a delicious weeknight meal!